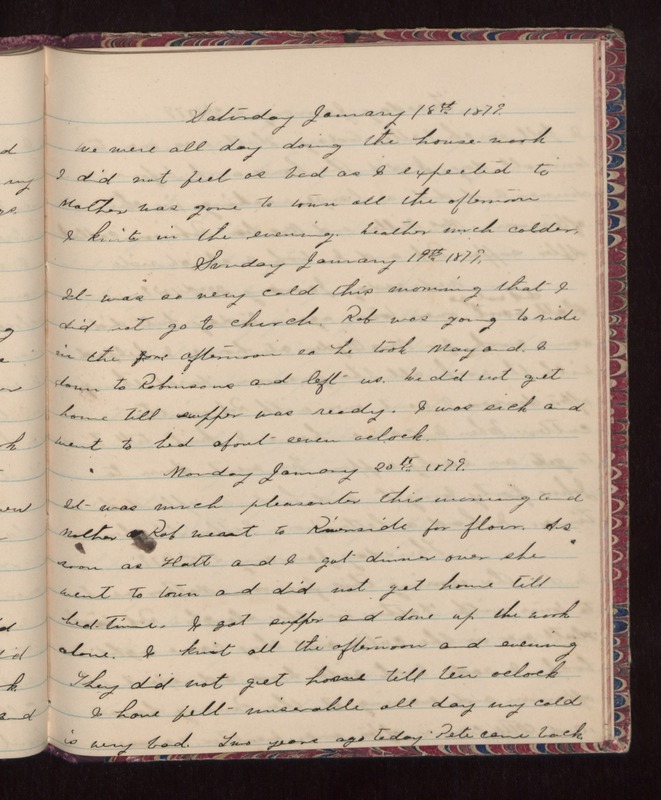 Saturday January 18th 1879 We were all day doing the house-work I did not feel as bad as I expected to Mother was gone to town all the afternoon I knit in the evening. Weather much colder. Sunday January 19th 1879 It was so very cold this morning that I did not go to church. Rob was going to ride in the afternoon so he took May and I down to Robinsons and left us. We did not get home till supper was ready. I was sick and went to bed about seven oclock. Monday January 20th 1879. It was much pleasanter this morning and Mother & Rob went to Riverside for flour. As soon as Hatt and I got dinner over she went to town and did not get home till bed time. I got supper and done up the work alone. I knit all the afternoon and evening They did not get home till ten oclock I have felt miserable all day my cold is very bad. Two years ago today Pete came back.